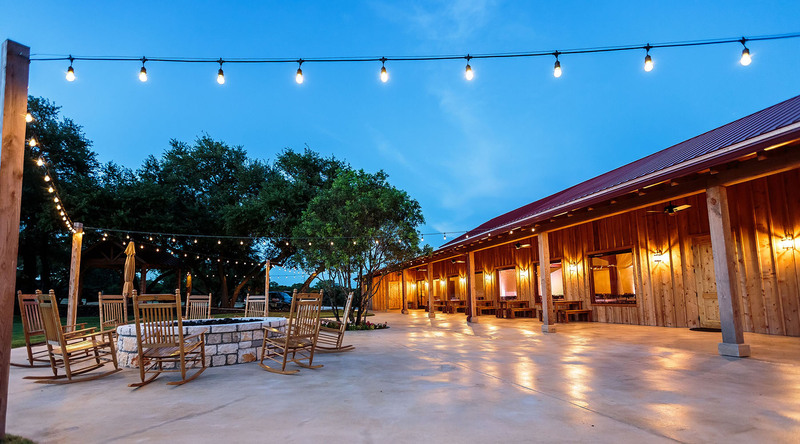 The Chandelier of Gruene Wedding Venue is located on spectacular secluded acreage in the Texas Hill Country just minutes from historic Gruene, Texas. 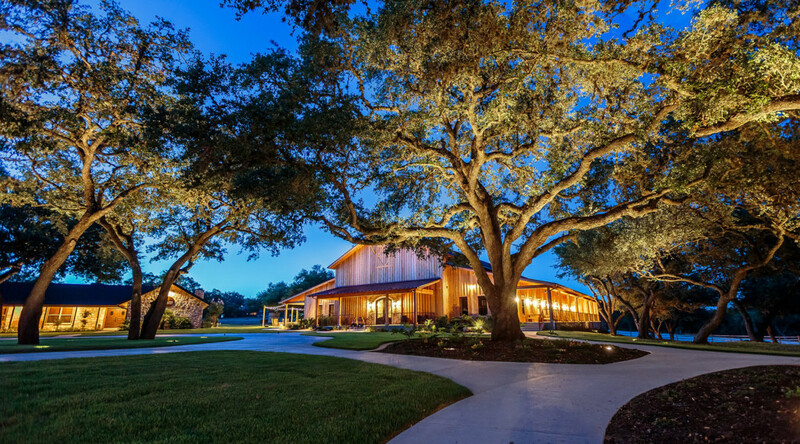 As you enter the property, an oak canopied lane leads you to our picturesque open-air chapel nestled amongst a grassy meadow surrounded by majestic towering oaks. Just steps from the chapel, you find our impressive 12,000 square foot Hall accompanied by 3,200 square feet of stunning covered patio area. 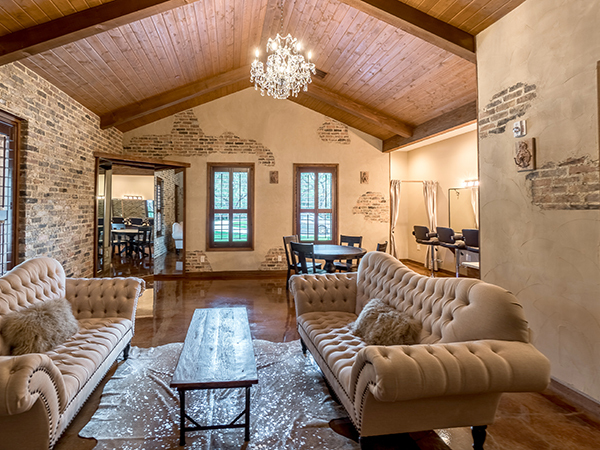 Throughout the property you will find architectural treasures such as cathedral ceilings, exposed rough sawn cedar beams, hand troweled walls, Chicago brick, lanterns, and several splendid glass chandeliers. All of this combines to create the perfect venue to host the event of your dreams! We had our wedding here a couple of weeks ago and could not have asked for anything more! The Chandelier of Gruene is hands down the most stunning venue in Texas! (Our guests thought so, too!) Myra, the owner, is such a pleasure to work with and will make sure all of your needs are met. We had over 420 people at our wedding and there was PLENTY of room to dance and sit! All in all, we could not have asked for a better venue! Make your dreams come true at The Chandelier of Gruene!! We booked The Chandelier of Gruene in January while still under construction. Although there was not even sheetrock up yet, we knew this place was going to be something special. 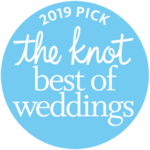 Myra and Chelsea were very responsive to every email I sent in the wedding planning process and allowed me to tour the venue 3 or 4 times with family and vendors while planning our big day. Our wedding was on September 23rd and it was the most beautiful setting I could have ever imagined. From exchanging our vows in the open-air chapel, to cocktail hour under beautiful oak trees, to the beautiful reception space where we danced the night away, everything was simply perfect. I highly recommend this venue if you are in search of an elegant Texas hill country wedding!!! From the moment we saw The Chandelier of Gruene, we knew it was perfect venue for us (and it wasn’t even completely built yet)! Myra is an amazing, amazing, amazing person and was always so kind when my family and I had a bajillion questions. I highly recommend The Chandelier of Gruene — we received so many comments about how beautiful the venue was, and how it was “literally a fairy tale” with deer in the background. I would do it all over again with The Chandelier. They made our special day truly amazing. This venue was absolutely my dream come true! There is nothing like it in the south Texas area. My mom and I went to tour before anything even had a roof and it was already everything I had ever wanted! 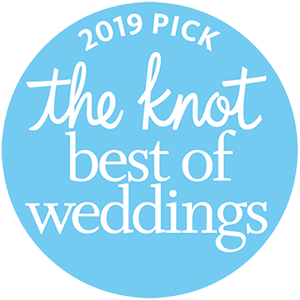 Myra and her family go above and beyond to make sure your questions are answered in a very timely manner as well as help you with anything you may need throughout your wedding planning process. I honestly cannot say or think of anything negative about this venue or the people who run it. 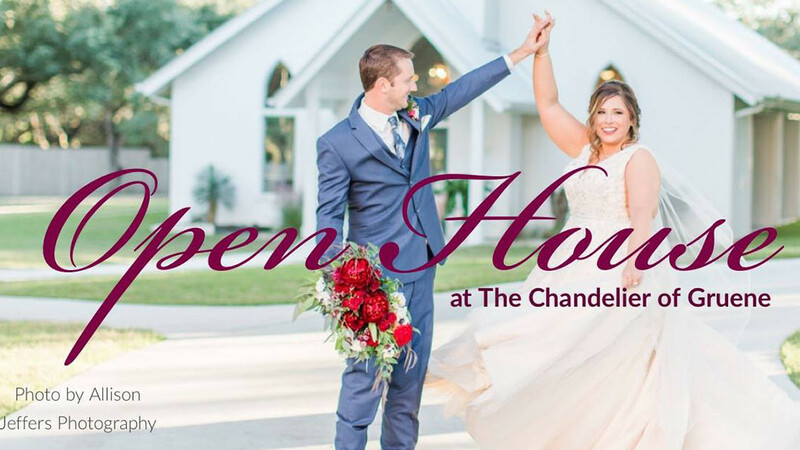 The chapel is perfect, the reception hall is spacious and beautiful, the bridal suite as well as the groom suite are big and gorgeous… everything was perfect!! Our wedding day was everything we ever dreamed it would be and more. You’re not going to find another venue more perfect than The Chandelier of Gruene!! I promise!! I am currently living out of town and my fiancé and my parents went to look at the Chandelier of Gruene before the framing was even finished. They fell in love with the renditions and with Myra, and we ended up booking before I even had the chance to see it. Although at the time I was apprehensive about booking a venue that was not built and I had never seen, I am SO thankful that we did. The Chandelier of Gruene is absolutely beautiful and looks exactly like the renditions that sold us in the first place. I cannot wait to get married here in December and I would recommend the Chandelier of Gruene and Mrya to everyone!! We booked The Chandelier of Gruene before the frame was up!! My daughter saw the vision and WOW!! I am so glad she did!! It is magnificent venue!! From the beginning Myra and her family were always available to answer our questions and concerns right away. Kaitlyn’s wedding day was a dream and Myra and Tim went over and above to make sure that the whole wedding day experience was absolutely perfect!! And it was!! When we expressed our concern about the hot weather during the rehearsal the night before Myra ran out and bought fans to be strategically place behind the bridesmaids during the ceremony. If you are planning a wedding in Texas you MUST consider The Chandelier of Gruene!! Beautiful Venue, fun town with lots of things to do!! You won’t regret it!! A walkway, directly from the bridal suite and surrounded by beautiful oak trees, leads you to our quaint open air chapel that can accommodate 300+ guests. The charming antique front doors await your grand entrance. The chapel is adorned with native hill country rock and large picture windows behind the altar giving view to a hundred plus year old oak tree, a perfect backdrop for your ceremony. Vaulted open truss ceiling, chandeliers, antique restored church pews, all surrounded by majestic towering oaks, sets the mood for your beautiful day. This picturesque scene will be the perfect place to share your intimate “I Dos” with loved ones. As you exit as Mr. & Mrs., stop and pull the rope to ring the church bell announcing your marriage. Just steps from the chapel you will find the indoor 12,000 square foot climate controlled venue with over 3,200 square feet of covered outdoor patios. The main entrance adorns exquisite iron doors, each side accented with lanterns, which lead you into the marvelous foyer area. This magnificent and striking chandelier lit entry with exposed beams, a cathedral ceiling, and Chicago brick walls sets the stage for your grand entrance. 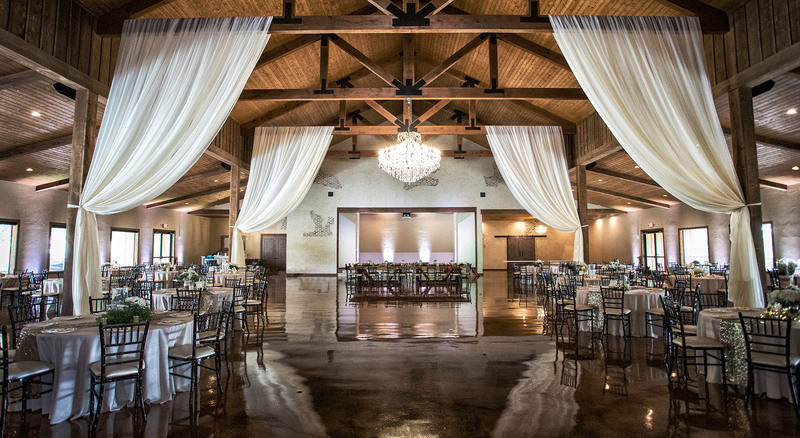 Continue walking through the 10 foot sliding barn doors into the grandiose reception area where you will be awestruck by the thirty two foot ceilings that boast exposed wood beams, exquisite chandeliers, hand troweled walls and Chicago brick. Just outside the door, onto the covered porch of the west side of the building, you will find steps that lead you to an outdoor entertainment area under the stars including a picturesque and relaxing chandelier lit covered patio canopied by large old oak trees, an oversized gas fire pit surrounded with rocking chairs and patio lights strung overhead. This is a perfect area for guests to have cocktails and hors d’oeuvres while awaiting your arrival or just simply a quiet and relaxing seating area to reminisce. The venue will comfortably accommodate 50-500 guests indoors with plenty of space outdoors to seat any additional guests for receptions, corporate meetings, family reunions or any other event you have in mind. The bride’s room is chic and elegant combining several textures including a cathedral ceiling with rough sawn cedar beams, a beautiful chandelier along with hand troweled walls and Chicago brick. You will also find tufted sofa and chairs, an ottoman coffee table, a 17ft hair and makeup bar, a large 3-way floor length mirror, and a dining table with chairs. All of this provides the perfect lounging and dressing area for you and your bridesmaids to comfortably gather prior to your ceremony. The groom’s room is appointed with the same architectural feel and is furnished with leather sofas, a full-length mirror, wet bar and a flat screen TV. This is the perfect man cave setting to provide the groom and his groomsmen a comfortable lounge and dressing room area. 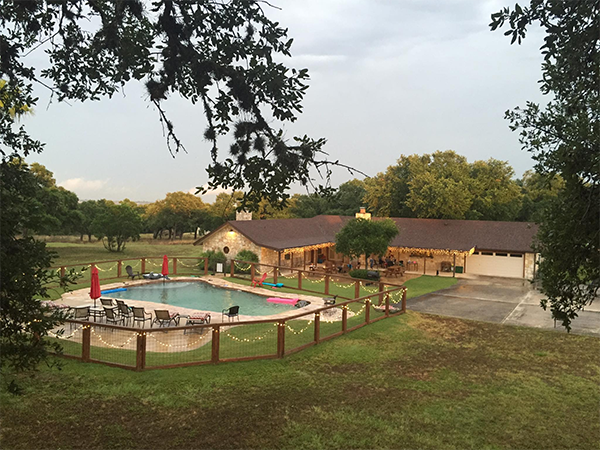 Adjacent to the hall sits the original ranch home, Escondida de Gruene, where our vision started. Escondida is a very warm and inviting home that showcases interior rock walls throughout, an open kitchen and living area with a cathedral ceiling, four bedrooms and four bathrooms. The residence also has a garage turned game room including a queen sleeper sofa, a foosball table, air hockey table and a flat screen TV. The home will accommodate 16 overnight guests and provides a large outdoor porch area with swimming pool, an ideal accommodation for the family of the bride or groom. It can also serve as a gathering place for your family pictures prior to the ceremony. If you are planning on providing a babysitter during your event, Escondida will be the perfect place to accommodate that as well. The Chandelier of Gruene came to reality after years of thought, research & prayers. 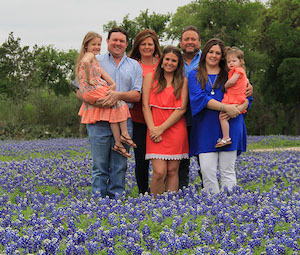 In 2011, Myra and Tim purchased property that had a beautiful ranch home nestled among majestic oaks. It was a private oasis of Texas Hill Country, but yet so close to everything, including Historic Gruene, Texas just minutes away. They knew it had so much potential and before long they turned the property into Escondida de Gruene, a vacation rental and gathering place for family vacations and events hosting guests from all over the world. 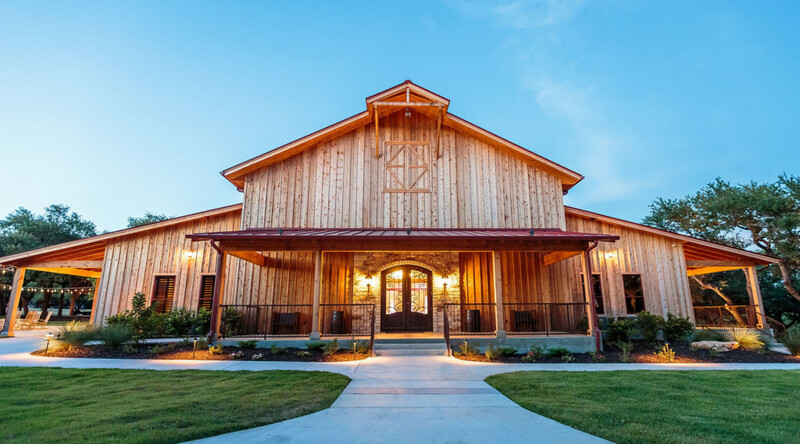 Their long term vision was to incorporate the home into an exquisite wedding & events venue with a warm and welcoming feel just like the ranch home had offered for so many years prior. With Myra’s work career having started in the bridal industry some 32 years ago as a bridal consultant at a family owned bridal boutique, the purchase of the property and her and her husband’s vision in mind, she realized that she still had that burning passion to be part of the bridal industry. So here she is 32 years later, married (31 years and counting), has two beautiful daughters, gained a wonderful son (in law) and two precious granddaughters. Now she is back in the industry again, this time with her family at her side sharing that same passion. Together, they have turned that vision in to a reality. Ready to share their legacy built on the foundation of love provided from Myra’s parent’s marriage of 65 years and Tim’s parent’s marriage of 58 years, they are excited and blessed to bring this amazing venue to future married couples hoping they will find the same love and friendship that their family has found.